Lab freezers are integral in preserving samples within the correct environment as many samples are vulnerable to variations in temperature. Proteins, for example must be contained within certain temperature limits to prevent denaturing. Lab freezers are also used to store DNA samples, blood and microorganisms within a scientific or medical laboratory. 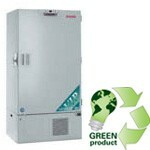 Depending on their use, the three main types are upright freezers, undercounter freezers and chest freezers. Ideally suited for ultra low storage solutions for biosafety, security, accessibility and performance. Long-term preservation of biologics, reagents, specimens, components, and in testing of various types. There is a wide range of lab freezers available on the market, with 391 products on LabWrench alone! Below is a list of some recently added lab freezer products, please click on the links to view more information. Look for these symbols , , to add the Lab Freezers category or your favorite manufacturers and equipment to your communities so you don’t miss out on all the latest news and updates!